I suppose it was my plan in the first place. A walk across part of Scotland, taking in some of the hills I’d like to climb and one of the hotels I’d really like to visit. 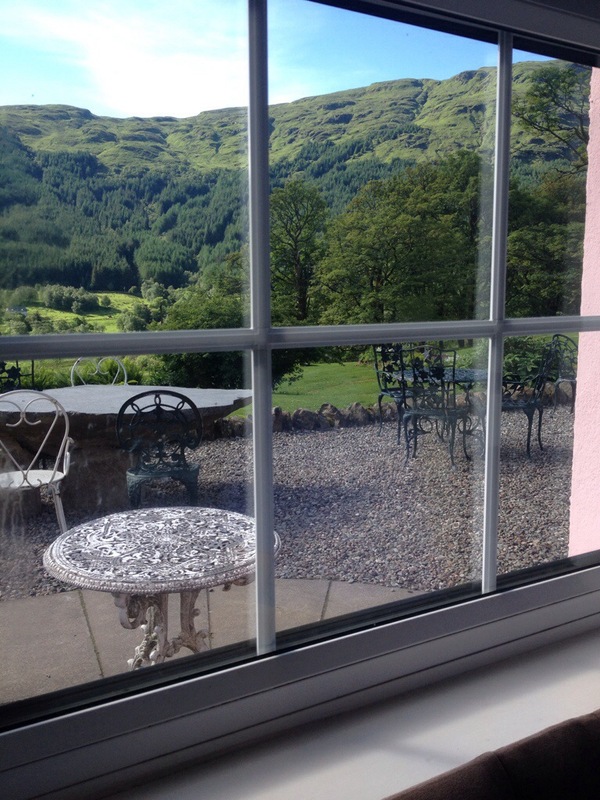 It sounds lovely but wrenching oneself away from the white sheets and white paneled walls of ones room (steam room included) at Monacyle Mhor hotel is almost as big a feat of self will as climbing the subsequent two Munros. Add in the wine consumed, the gin sipped and the heat of the sun inviting a leisurely breakfast on the terrace, and you have a bitter internal conflict to contend with. 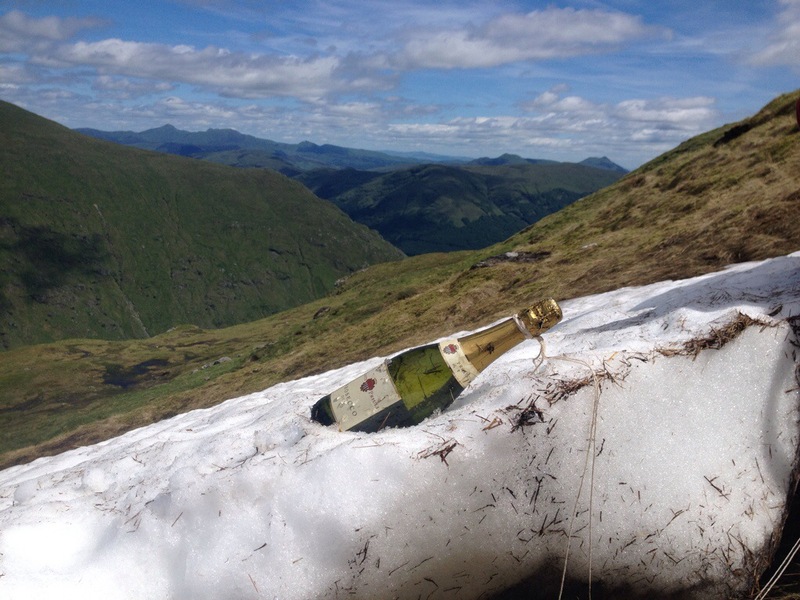 However, it was my idea and we did have a bottle of prosecco secreted in the rucksac, and so, off we went. Fortunately I managed to persued Tom, the owner of the Monacyle Mhor, to give us a lift to the end if the road in his land rover, complete with two doting dogs. ‘Did she try that one on you too?’ said my husband. If you can’t ask for a lift on your birthday then when can you ask for a lift? Anyway, it saved us two miles of walking, which I was very glad of as we slogged up the steep sides of Beinn Tulaichean. 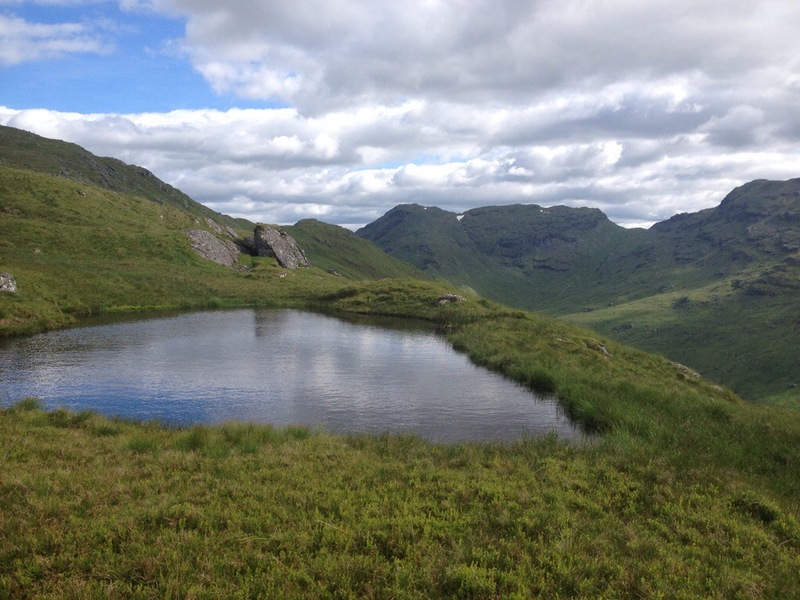 The only thing keeping me going at one point was the sight of a distant patch of snow, almost at the bealach on which I planned to prostrate myself to cool down in lieu of the cool and deep bathing pool that I knew from the map wasn’t on the summit. It would also be useful to cool the birthday booze. Lunch was a Mhor bread and salmon sandwich with snow-chilled prosecco and my friend’s home-made brownies. The fact we had a view of the entire world from end to end through a crystal clear sky, was an additional and unexpected blessing. 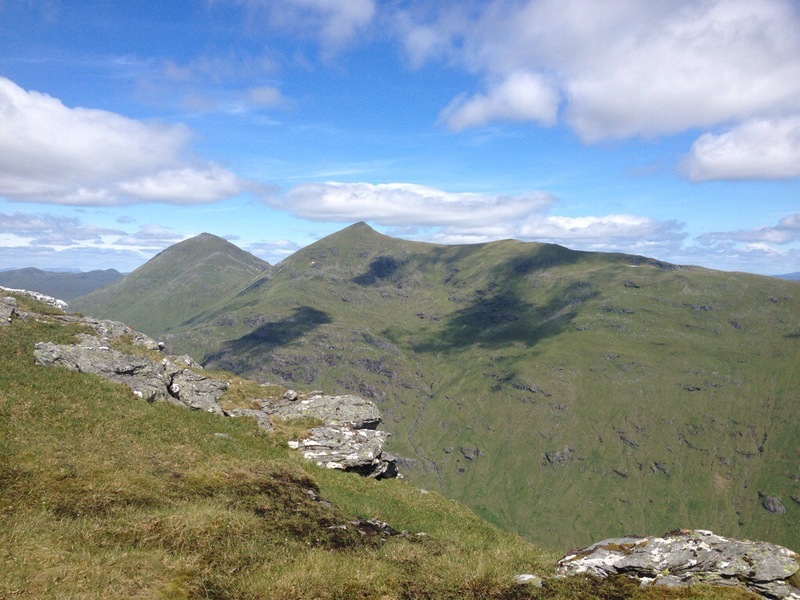 The walk down was a quick nip up Cruach Ardrain and then a walk down the beautiful ridge towards Crianlarich. We stopped to finish the day at a perfect peaty bathing pool right at the edge of a steep slope. In this respect it was rather like those infinity pools you see in ridiculous life-style magazines. Except this one had properly amazing views, fascinating vegetation around the edge and the bonus of peaty sludge between the toes. Just as I was about to emerge a couple of hill walkers appeared around the corner and so I was forced to nonchelenatly set off on a couple of extra laps as if that is what I had been meaning to do all along. It was after 6 when we made it down to the youth hostel, where we met a couple of newly arrived participants for the walk and repaired to the Rod and Reel. Less salubrious, perhaps, than the Monacyle Mhor, but a fine enough place for yet another birthday celebration. This entry was posted in Miscellaneous, The West High-mountain Way and tagged Monachyl Mhor; Cruach Ardrain; Ben Tulaichean; by nager. Bookmark the permalink.